Thousands of people have attended performances as part of the Lakes Alive Festival in venues across the Lake District this weekend. Cumbrian actress Roxanne Pallett has apologised to fellow contestant Ryan Thomsas for 'overreacting' to an incident that happened in the Big Brother House. Pallett spoke on Jeremy Vine’s panel show on Channel 5 after leaving the House. "I massively apologise to Ryan, his friends and fans and every single person who watched that," she said. Ofcom received more than 11,000 complaints since the incident occurred. Footage was released of the moment which showed Ryan Thomas 'playfully' punching Roxanne in the house which she later portrayed as a malicious and violent act. Viewers accused the actress of exaggerating what they interpreted as a play-fight and said that Thomas had been treated unfairly after receiving a formal warning about his behaviour from the show. The Carlisle-born actress rose to fame when she played Jo Stiles on ITV's Emmerdale. 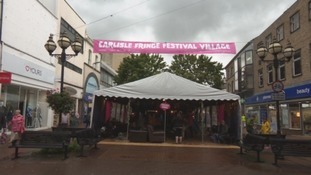 The annual Carlisle Fringe Festival is underway. It features a host of events at eleven venues across the city. The Lake District fells are alive with the sound of music! The 40-date tour begins in March next year, with the band performing at Carlisle Sands Centre on 29 April.